Verily group of company, a sister company to Google, has plans to make a smart shoe that would be able to monitor falls as well as track weight. Reports from CNBC states that Verily has allegedly been in search for partners to manufacture and market these shoes. The detection of Fall is now an increasingly popular feature for fitness gadgets, given that the newly launched Apple watch has this same fall detection feature. This makes a whole lot of sense due to the increasing number of Babies Boomer and the risk of injury caused by a fall. In actual fact, falls are the major cause of injuries and death for elderly ones, According to the analysis made by the Centers for Disease Control and Prevention, falls detectors truly could save lives. The smart shoes and other projects from Verily [formerly known as Google Life Sciences], includes; contact eye lenses for longsightedness and Special eating spoon for people with motion disorder. 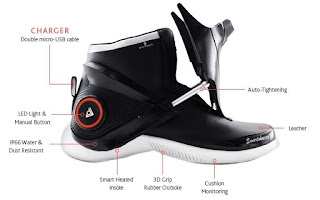 Verily is not the first to look into the development of smart shoes, E-VONE manufactured 26 styles of smart shoes and they contain fall detection sensors. Verily, E-VONE and every other producer of smart shoes will contend with the same problems which is: Nobody wants to wear the same exact shoe every day, and almost everyone doesn’t wear shoes indoors. At least smart shoes is a better fall-prevention idea than the airbag belt worth $800.